oh boy, if your IQ dropped 27 points on the Mensa test, then that means I'm dumber than a bag of rocks. But, on the other hand, I figure I'm a genius for getting out of scientology. My IQ tested (even before I took the Scientology test many times) at 152. Oh also, in about the ninth grade my IQ tested at 138. I had mostly A's and B's in Grade School, Junior and High School. I didn't try exceptional hard. In college, majoring in both Electronics Engineering (at one school) and Psychology (at another school), I graduated 30th out of 550 people, with a GPA of 3.62 (highest being 4.0 = A). I was quite lazy about it in college, and the LESS I cared, the better I did. That was all BEFORE Scientology. I didn't find that Scientology made ANY difference at all in my ability to understand anything at all. I would say that taking the time to expand my vocabulary and learning the derivation of words (through word clearing) DID help me. I didn't have a great vocabulary before Scientology, but it greatly expanded once I got used to clearing words. But, the thing that helped the most was to continue to study and learn about a great many subjects all throughout my life. No doubt, there are some forms of knowledge for which there are no tests! Having been born in, I thought and believed for most of my life the Scientology IQ test was scientific, obviously it isn't. It is the same test over and over again! It is amazing to me how everything I believed has to be evaluated. So women already get a handicap in that test, and a woman with a perfect score would automatically be 5 points lower than a man. Isn't anyone else kinda outraged at that statement?? I did not know there was a disparity for men/women. I don't remember what my score was way back then, but it would seem like the more you take the stupid test, the better you should do each time, regardless of any "benefit" from Scn services. I mean, just familiarity and memory would make you faster each time, giving you more time to think about the difficult questions. I didn't put much stock in any of those tests, especially the "leadership" test, which had REALLY annoying questions, as I recall. Come to think of it, the "personality" test was pretty horrid - gawd, I HATED taking that stupid thing. I wouldn't mind taking a different, non-Scn oriented IQ test, if it did not cost and was easy to do. Otherwise, no interest. If someone got the Scn IQ test and scanned and posted it, that might be interesting. We could all take it, score 100%, and then brag how smart we are now, LOL. Of course it is part of the trap. Scientology constantly appeals to the "ego". I remember reading a section of a transcript from an LRH tape where he said in no uncertain terms that less than 1/10th of 1% of all Earth's population could understand, and be attracted to Scientology at all. Obviously, the implication was that YOU were something VERY special. That "special" button is constantly pushed in Scientology. In the Sea Org it gets far worse (more intense). Hubbard just asserts that Sea Org members are "the elite", and that they should be "lionized when they walk into any org". In other words, you can take any dumbass, sign them up for the Sea Org, and then instantly, somehow, magically, they NOW are a member of the "elite". Hubbard constantly pushes the button that Scientology "makes the able more able". That implies, even if not verbalized, that for you to be involved with Scientology means you are "able" (as compared to the rest of the "less able" and "unable" dredges of the non-Scientology world). Hubbard also constantly asserts that to be a Scientologist is to accept and carry out the HIGHEST of DUTY and the HIGHEST of WORTHWHILE VENTURES in all of the universe. Obviously, people like to imagine that they are one of these "select few" who are "changing the course of all human life and history". I am special. I am special. I am special. I am special. I am special. I am special. I am special. I was a real dummy when I first got involved with Scientology. The Sea Org recruiter pushed the buttons that I would part of the "select few" who were "leading the charge", and who were the "most dedicated" and "able". I fell for it. I still had a fairly well-functioning ego at the time, and the recruiter worked on it (knowingly or unknowingly). Exaggerating your worth, value and superiority is a general factor in ALL of Scientology, of which the IQ test is only one minor example. I don't think it is that important, because I new many executives who only scored in the 120-130 range, and they found MANY other ways to feel "better than and superior to the degraded wog world". I remember reading a section of a transcript from an LRH tape where he said in no uncertain terms that less than 1/10th of 1% of all Earth's population could understand, and be attracted to Scientology. Obviously, the implication was that YOU were something VERY special. ^^^^^^^^ that about sums it up. One definition of intelligence is tthe ability to solve given problems in a given time correctly and consequently - something you will not find by Co$-ronbots. They only are able to follow "command intention". 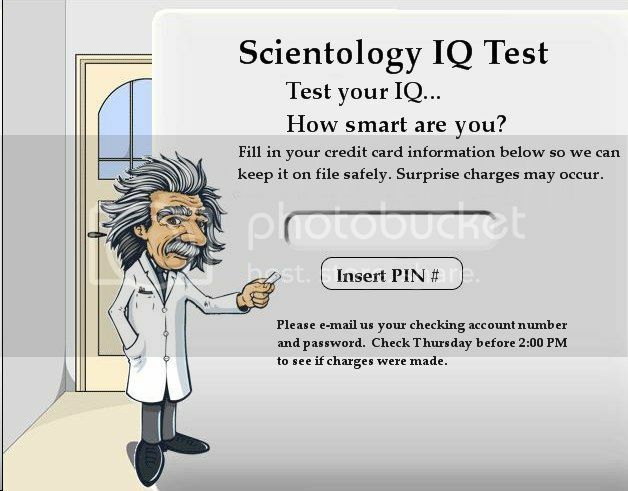 The scientology IQ-Test is comparable to what you normally would find in a woman´s magazine. It is not a standardized test and it misses the logical part. The high results above 150 show this too. The Mensa-Test is in fact a combination of two IQ-Tests: the IST-Amthauer 1974 and the Raven-Matrices test. With this combination you can´t fool the scores with "educated intelligence" (e.g. vocabulary questions). The results of the raven-matrices are also weighted with age. The maximum score of the Mensa-Test is 150. This matches with the accepted standards of intellectual giftedness (above 130). Since the Co$-IQ-test is not standardized and misses the logical part (logical thinking is not needed or wanted for ronbots) I would say a Co$-value of 154 equals a standardized real value of about 120 - 125. The newest thing in intelligence testing is the "AMT" which means (computerized) "adaptive matrices test". I don´t know if it has already been released to the public but I already did it about 2 years ago when it was still under development ("normalizing"). This is the heaviest stuff I came across because the computer recognizes if you are clever or not. So everyone gets different questions to solve. If you are clever, you don´t have to solve the boring mass-questions for the stupid ones, instead you will get much more complex problems to solve which the average guy will never see. Time needed plays a role therefore the test results at the top end are more precise than that of the normal raven matrices. The newest and latest: monthly automatic bank withdraws for the IAS. how deep in; were parents public or staff? I wouldn't mind taking a different, non-Scn oriented IQ test, if it did not cost and was easy to do. Otherwise, no interest. If someone got the Scn IQ test and scanned and posted it, that might be interesting. We could all take it, score 100%, and then brag how smart we are now, LOL. I was very surprised when i saw it - and lost all interest in the test after that. The leadership test is a whole other little animal - it is a test of fascist/totalitarian indoctrination. Also IQ tests don't measure intelligence, per se, but your capacity for it. Your IQ as a child should be almost the same as your IQ as an adult if properly done. A high IQ means you have the ability or capacity to be a highly intelligent person, but doesn't mean you actually are one. Got to use the tools at your disposal, a high IQ means you got Porsche engine rather than a dodge, but doesn't make any difference if you don't give it fuel and put the petal to the metal. A person with an IQ of 105, who doggedly pursues knowledge and studies hard,will be much smarter than a lazy person who never cracks a book who has an IQ of 130. Some scientists don't even buy into the validity of IQ scores at all and many think they are highly flawed and culturally biased. Intelligence is a very abstract concept, and accurately measuring an abstract, loosely defined concept isn't possible. That's a Pass/Fail Test, if you wasted your time taking that test ... you failed. By time I got around to taking that test they called it a 'Personality Test' and yes I failed, I wasted my time taking it. It's just a gimmick by Hubbard to install a fixed idea (fixed idea is auditing makes your IQ go higher). And to make it "scientific". well then how could it go higher? hey. I'm at the top, I'm done, don't need anymore auditing.